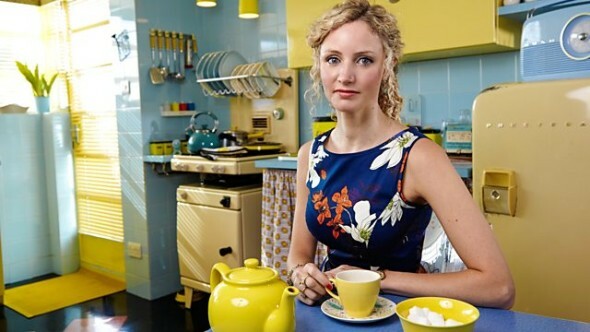 In Hidden Killers of the Post-War Home, historian Dr Suzannah Lipscomb looks at the hidden dangers of the British post-war home – and Planet Sputnik was on board to help set the scene. In the 1950s, people embraced modern design for the first time after years of austerity and self-denial. The contemporary home featured moulded plywood furniture, fibreglass, plastics and polyester – materials and technologies that were developed during World War II. Yet these space-age advances brought unseen dangers, proving that the ’50s could be fatal. Not all the items Britons purchased with their new-found spending power were as well designed as they might have been – and some were downright dangerous. In this programme, Dr Lipscomb talks about flammable frocks, dodgy electrics, carbon monoxide poisoning and exploding kids’ toys, among other historical hazards. See a clip here. The presenter and her production crew from Modern Television shot the link sequences at our 1950s location over two days, and the programme, the fifth in the popular Hidden Killers series, was shown on BBC TV in May 2016.